Don’t just read the title of this post and skip to the photos or you might think it is some soap opera drama about strained relations – instead, the title is, once again, my feeble attempt at a punny joke! I was recently doing a little reference checking and ended up on the website for Microscopy and Microanalysis (the journal, not the conference). On my first glance, I was surprised to see my name in the bottom right corner. Looking closer, I noticed that the paper Matt Nowell, David Field and I wrote way back in 2011 entitled “A Review of Strain Analysis Using Electron Backscatter Diffraction” is apparently the most cited article in Microscopy and Microanalysis. I am pleased that so many readers have found it useful. I remember, at the time, that we were getting a lot of questions about the tools within OIM Analysis™ for characterizing local misorientation and how they relate to strain. It was also a time when HREBSD was really starting to gain some momentum and we were getting a lot of questions on that front as well. So, we thought it would be helpful to write a paper that hopefully would answer some practical questions on using EBSD to characterize strain. From all the citations, it looks as though we actually managed to achieve what we had strived for. My co-authors on that paper have been great to work with professionally; but I also count them among my closest personal friends. David Field joined Professor Brent Adams’ research group at BYU way back in 1987 if my memory is correct. We both completed master’s degrees at BYU and then followed Brent to Yale in 1988 to do our PhDs together. David then went on to Alcoa and I went to Los Alamos National Lab. Brent convinced David to leave and join the new startup company TSL and I joined about a year later. David left TSL for Washington State University shortly after EDAX purchased TSL. Before, I joined TSL, Matt Nowell* had joined the company and he has been at TSL/EDAX ever since. Even with all the comings and goings we’ve remained colleagues and friends. I’ve been richly blessed by both their excellent professional talents and their fun spirited friendship. We’ve worked, traveled and attended conferences together. We’ve played basketball, volleyball and golf together. I must also brag that we formed the core of the soccer team to take on the Seoul National University students after ICOTOM 13 in Seoul. Those who attended ICOTOM 13 may remember that it was held shortly after the 2002 World Cup hosted jointly by Korea and Japan; in which Korea had such a good showing – finishing 4th. A sequel was played at SNU where the students pretty much trounced the rest of the world despite our best efforts 😊. 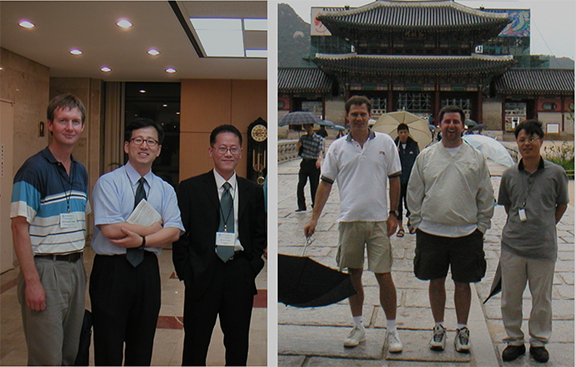 Here are a few snapshots of us with our Korean colleagues at ICOTOM 13 – clearly, we were always snappy dressers! * Don’t miss Matt’s upcoming webinar: “Applications of High-Speed CMOS Cameras for EBSD Microstructural Analysis”.